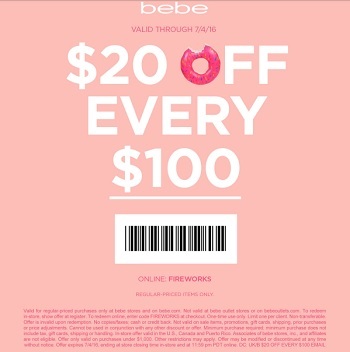 Get 20$ off every $100 you spend at any bebe store location in the U.S or at bebe online. In-store: print the coupon to receive the offer. Online: use online promo code FIREWORKS at checkout. Valid on regular priced purchase only. Source of the information is bebe. Offer expires 07/04/2016. For more details visit any bebe store location in the U.S. or bebe online.